^ "Airports field listing". CIA The World Factbook. Archived from the original on 25 June 2014. Retrieved 16 June 2014. ^ "Helipads field listing". CIA The World Factbook. Archived from the original on 4 June 2011. Retrieved 16 June 2014. ^ "70% of Households Use Bikes". The Daily NK. 30 October 2008. Archived from the original on 6 July 2014. Retrieved 16 June 2014. ^ a b "North Korea to Become Strong in Science and Technology by Year 2022". The International Institute for Far Eastern Studies. 21 December 2012. Archived from the original on 4 September 2015. Retrieved 17 June 2014. ^ "Two Koreas can cooperate in chemistry, biotech and nano science: report". Yonhap News. 6 January 2010. Archived from the original on 3 December 2013. Retrieved 17 June 2014. ^ "High-Tech Development Zones: The Core of Building a Powerful Knowledge Economy Nation". The International Institute for Far Eastern Studies. 5 June 2014. Archived from the original on 23 April 2015. Retrieved 17 June 2014. ^ ""Miraewon" Electronic Libraries to be Constructed Across North Korea". The International Institute for Far Eastern Studies. 22 May 2014. Archived from the original on 4 September 2015. Retrieved 17 June 2014. ^ Pearlman, Robert. "North Korea's 'NADA' Space Agency, Logo Are Anything But 'Nothing'". Space.com. Archived from the original on 14 May 2016. ^ a b Lele, Ajey (2013). Asian Space Race: Rhetoric Or Reality. Springer. pp. 70–72. ISBN 978-81-322-0732-0. ^ Talmadge, Eric (18 December 2012). 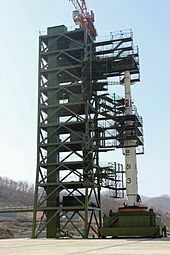 "Crippled NKorean probe could orbit for years". AP. Archived from the original on 29 October 2013. Retrieved 18 December 2012. 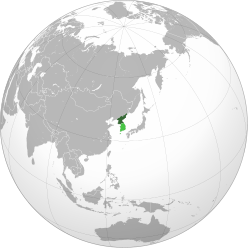 ^ "Japan to launch spy satellite to keep an eye on North Korea". Wired. 23 January 2013. Archived from the original on 9 July 2014. Retrieved 17 June 2014. ^ "High five: Messages from North Korea". The Asia Times. 19 March 2009. Retrieved 17 June 2014. ^ "North Korea appears to ape Nasa with space agency logo". The Guardian. 1 April 2014. Archived from the original on 4 July 2014. Retrieved 17 June 2014. ^ a b "UN Security Council vows new sanctions after N Korea's rocket launch". BBC News. Archived from the original on 7 February 2016. Retrieved 7 February 2016. ^ "U.N. Security Council condemns North Korea launch - CNN.com". CNN. Archived from the original on 7 February 2016. Retrieved 7 February 2016. ^ Gayle, Justin McCurry Damien; agencies (7 February 2016). "North Korea rocket launch: UN security council condemns latest violation". The Guardian. ISSN 0261-3077. Archived from the original on 7 February 2016. Retrieved 7 February 2016. ^ "Country Comparison: Telephones – main lines in use". The World Factbook. CIA. Archived from the original on 27 December 2016. ^ French 2007, p. 22. ^ a b c "North Korea embraces 3G service". BBC. 26 April 2013. Archived from the original on 28 May 2014. Retrieved 17 June 2014. ^ Rebecca MacKinnon (17 January 2005). "Chinese Cell Phone Breaches North Korean Hermit Kingdom". Yale Global Online. Archived from the original on 9 October 2009. Retrieved 2 August 2007. ^ a b "North Korea: On the net in world's most secretive nation". BBC. 10 December 2012. Archived from the original on 8 July 2014. Retrieved 17 June 2014. ^ Bertil Lintner (24 April 2007). "North Korea's IT revolution". Asia Times. 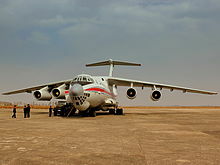 Retrieved 11 May 2007. 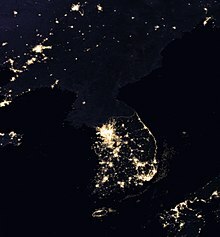 ^ a b "North Korea has 'Bright' idea for internet". News.com.au. 4 February 2014. Archived from the original on 18 July 2014. Retrieved 17 June 2014. ^ Bryant, Matthew (19 September 2016). "North Korea DNS Leak". Archived from the original on 21 September 2016. Retrieved 22 September 2016. ^ Bruce G. Cumings. "The Rise of Korean Nationalism and Communism". 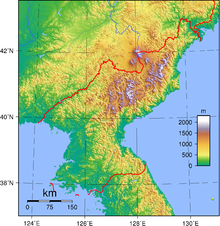 A Country Study: North Korea. Library of Congress. Call number DS932 .N662 1994. Archived from the original on 10 April 2007. ^ a b c d "Contemporary Cultural Expression". Library of Congress Country Studies. 1993. Archived from the original on 13 December 2012. Retrieved 3 July 2014. ^ North Korea Handbook 2003, pp. 496–497. ^ "Democratic People's Republic of Korea". UNESCO. Archived from the original on 1 July 2014. Retrieved 6 June 2014. ^ a b Andrei Lankov (13 February 2011). "Socialist realism". The Korea Times. Archived from the original on 26 July 2014. Retrieved 6 July 2014. ^ a b c "A window into North Korea's art world". The Asia Times. 16 June 2012. Retrieved 14 July 2014. ^ a b "Mansudae Art Studio, North Korea's Colossal Monument Factory". Bloomberg Business Week. 6 June 2013. Archived from the original on 24 February 2015. Retrieved 14 July 2014. ^ "Senegal President Wade apologises for Christ comments". BBC News. London: BBC. 31 December 2009. Retrieved 14 July 2014. ^ "Heroes' monument losing battle". The Namibian. 5 June 2005. Archived from the original on 24 July 2014. Retrieved 14 July 2014. ^ "Complex of Koguryo Tombs". unesco.org. Retrieved 1 September 2017. ^ a b c "Literature, Music, and Film". Library of Congress Country Studies. 1993. Retrieved 14 July 2014. ^ a b "North Korean Opera Draws Acclaim in China". The New York Times. 28 July 2010. Archived from the original on 26 July 2014. Retrieved 14 July 2014. ^ "Revolutionary opera "Sea of Blood" 30 years old". KCNA. August 2001. Archived from the original on 12 October 2014. Retrieved 14 July 2014. 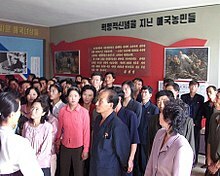 ^ "North Korea: Bringing modern music to Pyongyang". BBC News. 3 January 2013. Archived from the original on 9 July 2014. Retrieved 14 July 2014. ^ "Meet North Korea's new girl band: five girls who just wanna have state-sanctioned fun". The Telegraph. 29 May 2013. Archived from the original on 1 July 2014. Retrieved 14 July 2014. ^ North Korea Handbook 2003, p. 478. ^ "Moranbong: Kim Jong-un's favourite band stage a comeback". The Guardian. 24 April 2014. Archived from the original on 26 August 2014. Retrieved 14 July 2014. ^ "Pyongyang goes pop: How North Korea discovered Michael Jackson". The Guardian. 1 February 2011. Archived from the original on 25 July 2014. Retrieved 14 July 2014. ^ North Korea Handbook 2003, pp. 423–424. ^ North Korea Handbook 2003, p. 424. ^ North Korea Handbook 2003, p. 475. ^ "Benoit Symposium: From Pyongyang to Mars: Sci-fi, Genre, and Literary Value in North Korea". SinoNK. 25 September 2013. Archived from the original on 13 June 2014. Retrieved 14 July 2014. ^ a b Country Study 2009, p. 114. ^ Country Study 2009, p. 94. ^ "Pyongyang goes pop: Inside North Korea's first indie disco". The Guardian. 22 February 2011. Archived from the original on 20 July 2014. Retrieved 14 July 2014. ^ Kretchun, Nat; Kim, Jane (10 May 2012). "A Quiet Opening: North Koreans in a Changing Media Environment" (PDF). InterMedia. Archived from the original (PDF) on 14 January 2013. Retrieved 19 January 2013. The primary focus of the study was on the ability of North Koreans to access outside information from foreign sources through a variety of media, communication technologies and personal sources. The relationship between information exposure on North Koreans’ perceptions of the outside world and their own country was also analyzed. ^ "North Korea". Reporters Without Borders. 2017. Archived from the original on 26 April 2017. Retrieved 28 April 2017. ^ "Freedom of the Press: North Korea". Freedom House. Archived from the original on 7 July 2014. Retrieved 14 July 2014. ^ "Meagre media for North Koreans". BBC News. 10 October 2006. Archived from the original on 20 August 2014. Retrieved 14 July 2014. ^ "North Korea Uses Twitter, YouTube For Propaganda Offensive". The Huffington post. 17 August 2010. Archived from the original on 7 October 2014. Retrieved 14 July 2014. ^ Calderone, Michael (14 July 2014). "Associated Press North Korea Bureau Opens As First All-Format News Office In Pyongyang". The Huffington Post. Archived from the original on 16 April 2012. Retrieved 26 March 2012. ^ a b O'Carroll, Chad (6 January 2014). "North Korea's invisible phone, killer dogs and other such stories – why the world is transfixed". The Telegraph. Archived from the original on 8 October 2014. Retrieved 14 July 2014. ^ Taylor, Adam (29 August 2013). "Why You Shouldn't Necessarily Trust Those Reports Of Kim Jong-un Executing His Ex-Girlfriend". businessinsider.com. Business Insider. Archived from the original on 19 January 2014. Retrieved 19 January 2014. ^ Fisher, Max (3 January 2014). "No, Kim Jong Un probably didn't feed his uncle to 120 hungry dogs". Washington Post. Washington, D.C. Archived from the original on 26 July 2014. ^ Korean Cuisine (한국요리 韓國料理) (in Korean). Naver / Doosan Encyclopedia. Retrieved 15 July 2014. ^ "Okryu Restaurant Becomes More Popular for Terrapin Dishes". Korean Central News Agency. 26 May 2010. Archived from the original on 9 June 2011. Retrieved 15 July 2014. ^ "Okryu restaurant". 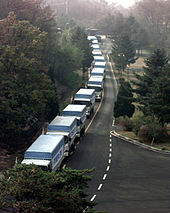 Korean Central News Agency. 31 August 1998. Archived from the original on 8 January 2011. Retrieved 15 July 2014. ^ "The mystery of North Korea's virtuoso waitresses". BBC News. 8 June 2014. Archived from the original on 25 July 2014. Retrieved 15 July 2014. 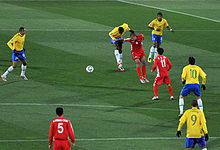 ^ "Fifa investigates North Korea World Cup abuse claims". BBC News. 11 August 2010. Archived from the original on 29 August 2014. Retrieved 15 July 2014. ^ "When Middlesbrough hosted the 1966 World Cup Koreans". BBC News. 15 June 2010. Archived from the original on 18 May 2014. Retrieved 15 July 2014. ^ "Rodman returns to North Korea amid political unrest". Fox News. 19 December 2013. Archived from the original on 19 December 2013. Retrieved 20 December 2013. 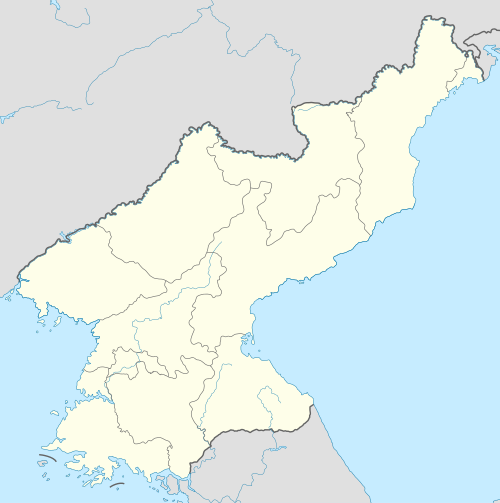 ^ "Democratic People's Republic of Korea". International Olympic Committee. Archived from the original on 2 July 2014. Retrieved 15 July 2014. ^ "North Korea's Kim Un Guk wins 62kg weightlifting Olympic gold". BBC News. 30 July 2012. Archived from the original on 16 October 2015. Retrieved 15 July 2014. ^ "North Korea rewards athletes with luxury apartments". Reuters. 4 October 2013. Archived from the original on 20 December 2013. Retrieved 20 December 2013. ^ a b "North Korea halts showcase mass games due to flood". reuters. 27 August 2007. Archived from the original on 10 February 2009. ^ a b "Despair, hunger and defiance at the heart of the greatest show on earth". The Guardian. 17 May 2002. Archived from the original on 9 September 2014. Retrieved 15 July 2014. ^ "Kim Jong-un orders spruce up of world's biggest stadium as 'millions starve'". The Daily Telegraph. 26 September 2013. Archived from the original on 12 June 2014. Retrieved 15 July 2014. ^ "North Korea allows tourists to run in Pyongyang marathon for the first time". The Daily Telegraph. 3 April 2014. Archived from the original on 1 August 2014. Retrieved 15 July 2014.